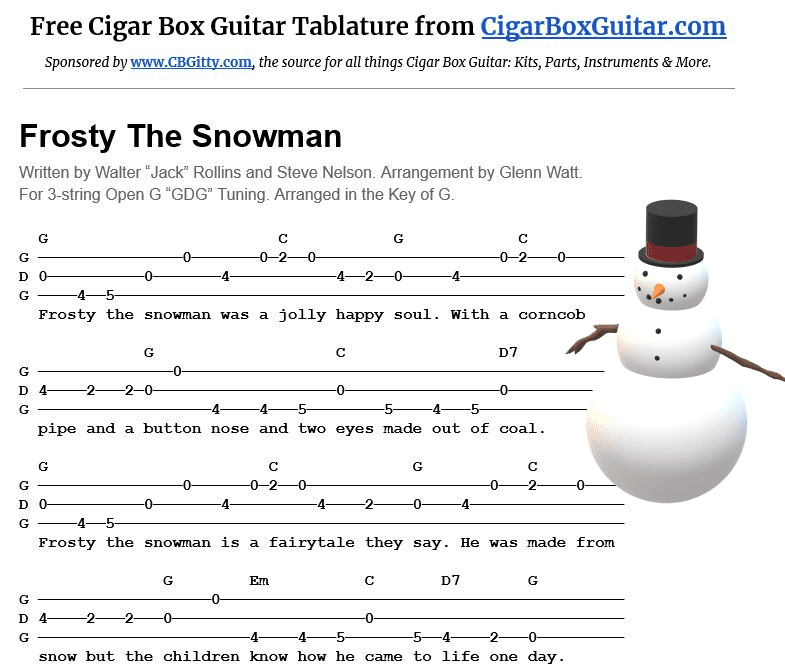 Delight the children in your life (and your own inner child) by learning Frosty the Snowman on your 3-string cigar box guitar with this totally free to download tablature. Written by Walter “Jack” Rollins and Steve Nelson, Frosty the Snowman was popularized by the likes of Gene Autry and Jimmy Durante. Although there’s no mention of any holiday in the song, Frosty the Snowman is widely regarded as a Christmas-themed tune. So no matter the occasion, be prepared to surprise and delight friends and family with your rendition of Frosty the Snowman on your 3-string cigar box guitar. Just click on the image below to download the tab. Would you like a little help learning how to read 3-string cigar box guitar tablature? Watch this video for a step-by-step tutorial that will get reading tab in no time!